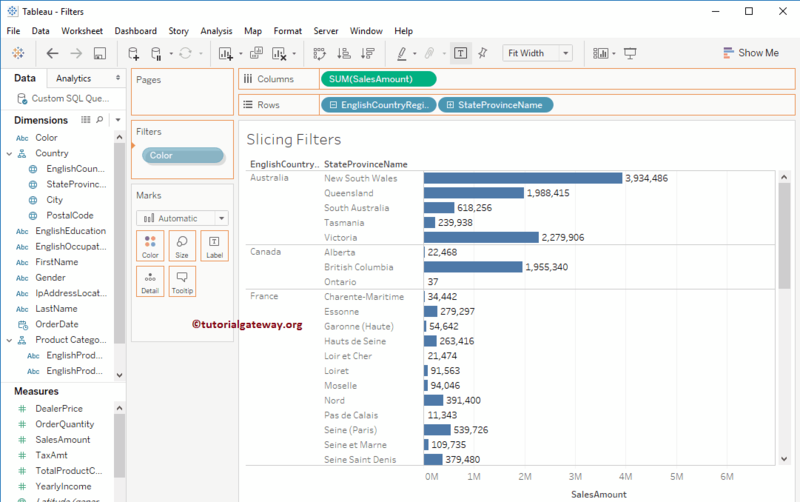 Slicing Filters in Tableau are also called as Calculation Filters or Slicers. These are the dimension filters, and we have to apply them to the dimensions field. The behaviour of these filters is different for Multi-Dimensional Data Source, compared to the Relational data source. Slicing Filter: If we place a dimension on the Filter Shelf, and that dimension is not present in any other shelf (independent from Rows and Columns) then we can call it as the Slicing Filter. 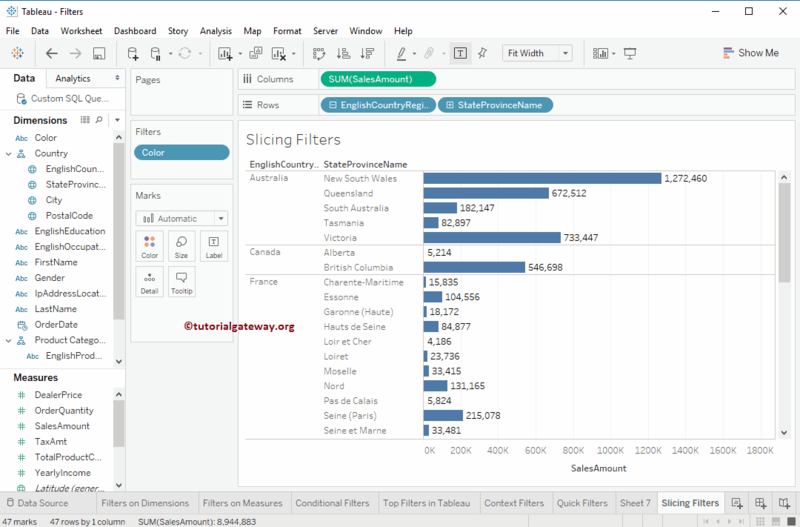 In this article, we will show you, How to create Slicing Filters in Tableau with an example. 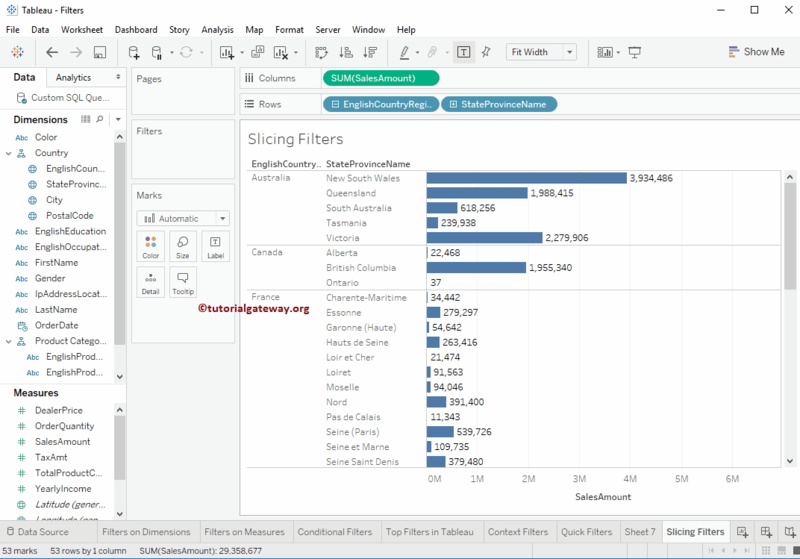 For this demonstration, we are going to use the data source that we created in our previous article so, Please visit Data Labels in Tableau Reports article to understand the Data Source. Before getting into this, I suggest you to refer Tableau Filters to understand the basic filter techniques. In this example, we want to demonstrate the Slicing filters in Tableau. 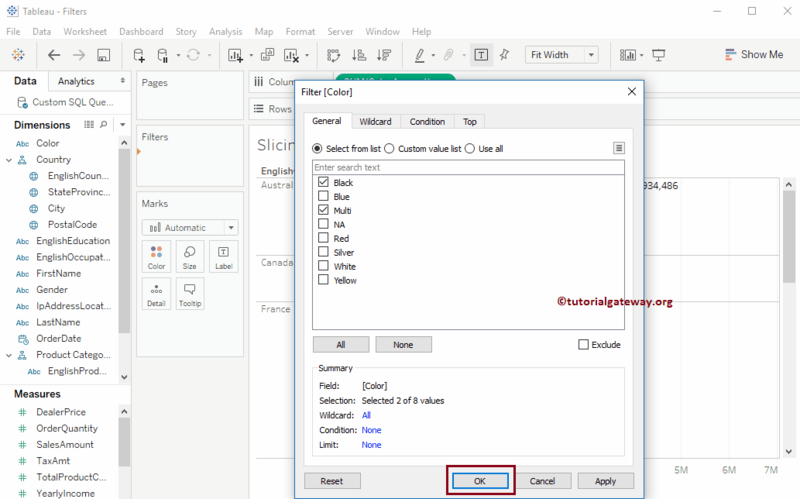 For this first, Drag and Drop the English Country region Name from Country Hierarchy present in the Dimension Region to Rows Shelf and Sales Amount Measures region to Columns Shelf. By default, tableau will generate the Bar Chart as shown below. Next, we want to apply filter condition on Colors Dimension. And it is not the member of any existing shelf (Marks, Rows, Columns, and Pages). So, drag and drop the Color from Dimension Region to Filters Shelf as shown below. Once you drop the Color to Filters Shelf, a new window called Filter will be opened as shown below. Here, we are selecting Black and Multi colours. I suggest you to refer Tableau Filters on Dimensions article to understand the properties in the following window. From the below screenshot you can observe that the below report is displaying the Sales amount of all the state province names present in the country, whose Color is Black, or Multi.